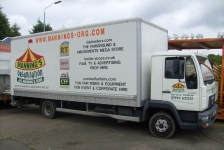 The equipment Carnival Funfairs use is mainly heavy and bulky, so in order to keep the rides safe, secure and dry, we have specialised hauling trailers. Most of these trailers are integrated into the amusement for easy transport. In most cases, having specialised closed top trailers protects the rides and amusements from unnecessary damage from weathering, aiding the ride's longevity. The trailers together with our Scania and Volvo trucks allow the rides and amusements to be transported reliably. All ride and amusement units are powered by remote generator systems connected to the trucks. These generator systems incorporate a built-in silencer, limiting the amount of harmful gases, odours and noise exposed to fairground patrons. The rides are capable of being powered from standard mains power if required, so rides do not explicitly need a generator system for operation. A mechanical mishap can occur at any time, so Carnival Funfairs aims to reduce the possible risk to it patrons by implementing a policy of periodic upgrading, renewal and maintenance to the rides it uses. Coupled with this, Carnival Funfairs ensures that its high level of health and safety rules and regulations are adhered to by staff and operators. 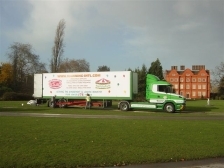 In the eventuality of mechanical ride or amusement failure, Carnival Funfairs will be ready with its own small fleet of service vans to recover the situation as quickly as possible. The in-house technicians will ensure that the ride or amusement has been properly repaired, is in a safe working order and ready to resume service.